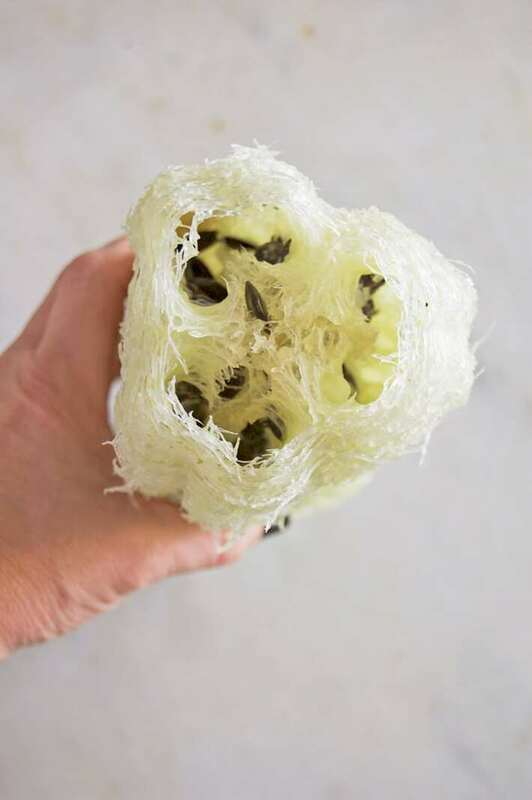 THE ULTIMATE GUIDE TO SUCCESSFULLY GROWING LUFFA SPONGES. 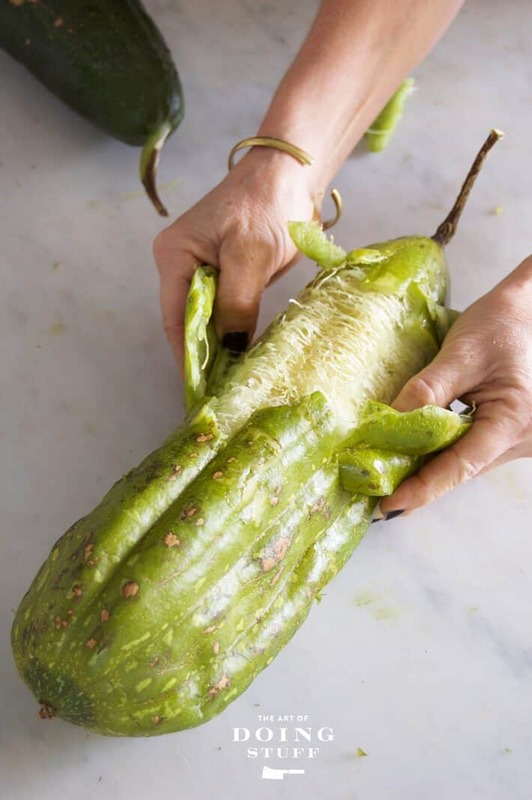 Wanna learn how to grow a Luffa? Yeah. So did I. So when I figured it out I thought … I’d better tell you exactly how to do it too! As a matter of fact, no they do not grow in the ocean. Or the sea. Or any other body of water. That’s always the biggest shock to people when you tell them they can grow their own luffa sponges; the fact that they grow on land, not in the water. You’re thinking of Spongebob Squarepants. 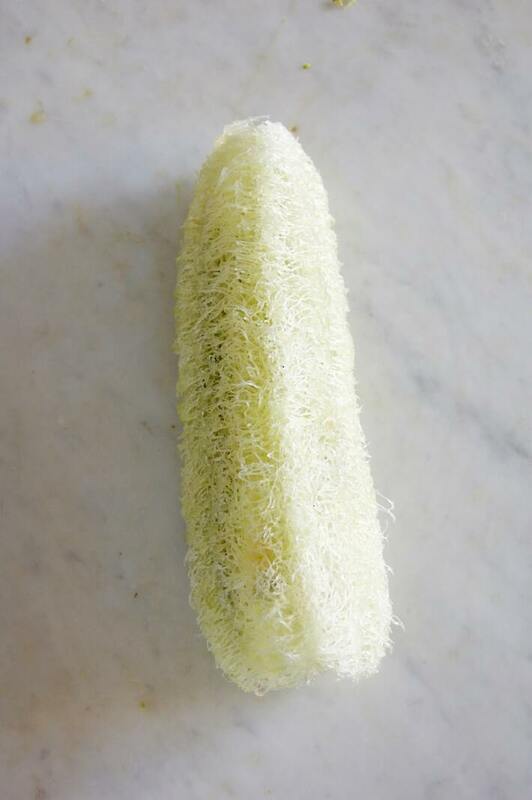 A bit about the Luffa. Luffa, Loofah. All the same thing. Luffas are part of the gourd family and grow on vines that can get to be 30′ long. Trust me on this. 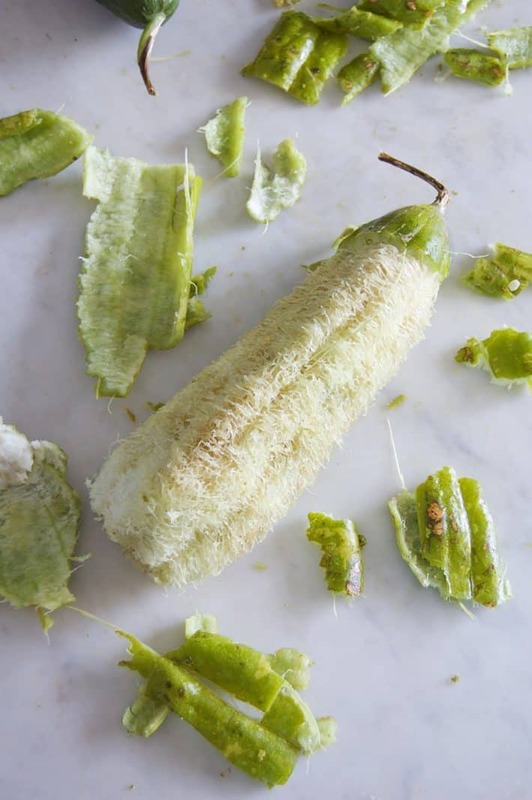 The part of the Luffa you’re used to seeing is actually the inside fibres of the gourd, which lay beneath the green skin. Immature Luffas look pretty much like a cucumber or zucchini and can be eaten when they’re very young (4-8″ long). Luffas turn brown and become light as a feather when they’re ready to pick but if there’s a danger of frost you can pick them earlier (like I did). For the past decade or so I’ve been killing myself trying to figure out how to be completely successful growing luffa in my zone 6 climate. Luffa need a longggg growing season and they also seem to be easily frightened. Like you can frighten a Luffa to death. More on that in a few moments. To figure out how to successfully grow a Luffa sponge, you have to know how to very, very unsuccessfully grow a Luffa sponge. Luckily for you, I have all kinds of experience in that particular area. In fact, I’ve spent the better part of a decade being really great at unsuccessfully growing Luffa sponges. Not to brag. There are 3 main areas where things can go horribly wrong. Your seeds won’t germinate. Because they’re little asshead seeds that hate you. Your little luffa seedling goes into shock when you transplant it outside and it dies of fright or at least goes into a month long coma. Your vine grows but you never get to the point of seeing fruit before the frost kills it. I’m going to show you how to overcome all of those issues so you can grow your very own organic Luffa sponge this summer. Handy for showers, scrubbing pots and whacking people on the head with. So how can you overcome these obstacles so that you can proudly peel your very first luffa sponge? These few simple tips are the only thing between you and a Luffa. If you’re in a cooler zone, start your Luffa seeds early, indoors, 6 weeks before the last frost date. Use new Luffa seeds and soak them in water for 24 hours prior to planting. Seeds that have been hanging around for years probably won’t germinate. 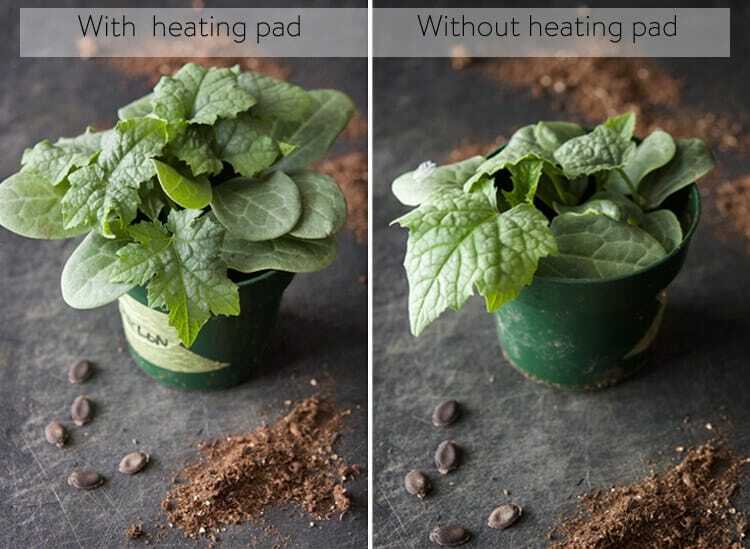 Increase your success at germination by starting your seeds on a seed heat pad. 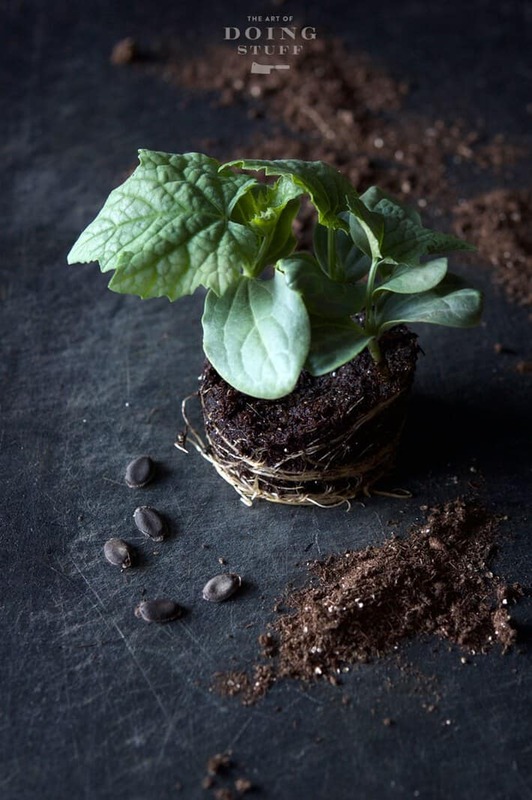 Transplant into biodegradable pots once the first “true” set of leaves have formed. Using pots that decompose reduces the risk of transplant shock which Luffa plants are prone to. 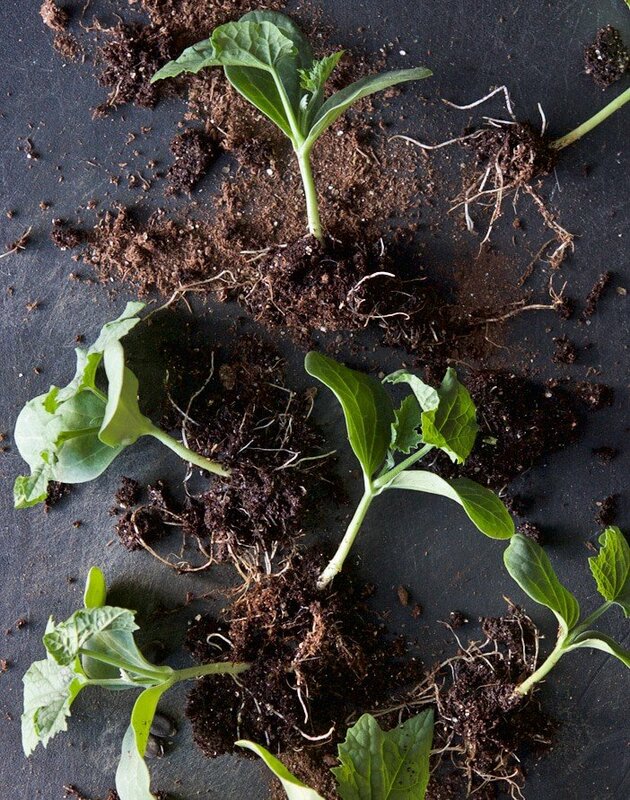 After a week or so of hardening off, plant your seedlings in an area that gets FULL sun. As much sun as possible. Anything less and you won’t get any Luffas. Plant your seedlings at the base of a really strong structure that its vines can climb on and cling to. Chain link fence or something similar is perfect. If after planting out, a cold snap threatens, cover the seedlings with a vented cloche. A plastic pop bottle cut in half with a lot of air holes punched into it would work fine. A few days of cold weather will STOP a luffa from growing and it could take a month before they get over the shock. Keep the Luffa watered. No water equals no growing! Now you wait. And wait. And wait. By October you should have big, green Luffas. Pick your Luffa sponges BEFORE they’re hit by frost even if they’re still green. Technically you aren’t supposed to pick them until they’re dried out and brown, but in Zone 6 it’s rare for them to get to that stage. You can still pick them when they’re green and get perfectly acceptable Luffas. They’re just a bit harder to peel. I’ve grown Luffas before but this year was the first year I got truly, large, useable, perfect fibres inside my Luffas. So if you read any other article on Luffa sponges that tells you you’ll only get a useable sponge from a Luffa that’s dried to a dark brown on the vine don’t believe it. It ain’t true. There’s a bit of a funny story behind picking my Luffa sponges this year actually. It was Thanksgiving at my house and all but 2 of the dinner guests were slouching in the family room waiting for the turkey to hit the table and the last 2 guests to arrive. I went in to check to see if anyone needed anything and everyone in the room happened to be discussing the weather. Because we’re Canadian. And not especially well versed in politics. Apparently there was going to be frost that night. WAIT?!!! WHAT??@!!! TONIGHT??!! THERE’S GOING TO BE FROST TONIGHT??!!!! SHITMOFARKLESPARX!! And out the door I went, my bewildered Uncle Jack in tow, whizzing past the last 2 guests who were just pulling up. B E B A C K L A T E R !!!!!!! In the middle of hosting Thanksgiving dinner I left all of my guests in my house and dragged my Uncle up to my community garden, a 5 minute drive away, to pick all of my Luffas. They weren’t dried and brown on the vine yet but I knew if they got hit by frost they’d be ruined. They’d either turn to “ick” or they’d become all discoloured inside. Since we were already there I figured I might as well pick the rest of my tomatoes, kale, green beans, jalapenos and red peppers. Since we were there. 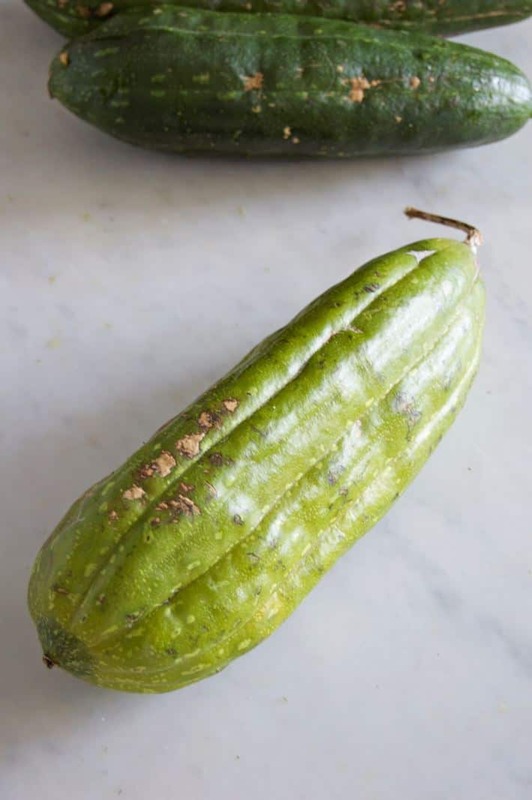 In an ideal world Luffa gourds will become around 24″ inches long and go from dark green, the light green, to yellowish, to completely dried out, crispy and brown on the vine. But if your growing climate isn’t long enough, you may just end up with vines covered in dark and light green gourds, which is what I ended up with. I left them to dry out a tiny bit on my front porch after picking them for about a month and then I couldn’t stand it anymore and started to peel away the skin. To my amazement, underneath all that tough skin were perfect luffa sponges. The green skin is hard to get off but with with my stubby, bionic, man-baby thumbs I managed quite nicely. Two of my 6 Luffas had matured enough that the seeds inside were big and dark. THESE are the perfect seeds for saving for planting. So let’s talk about how to plant your seeds and WHY a seed heat pad is so important to successful germination of Luffa seeds. Last year when I planted my Luffa seeds I planted them, kept them watered and waited. Nothin’. I got nothin’ for over a month. In fact I’d given up on them when 3 of the 15 or so seeds that I planted sprouted. 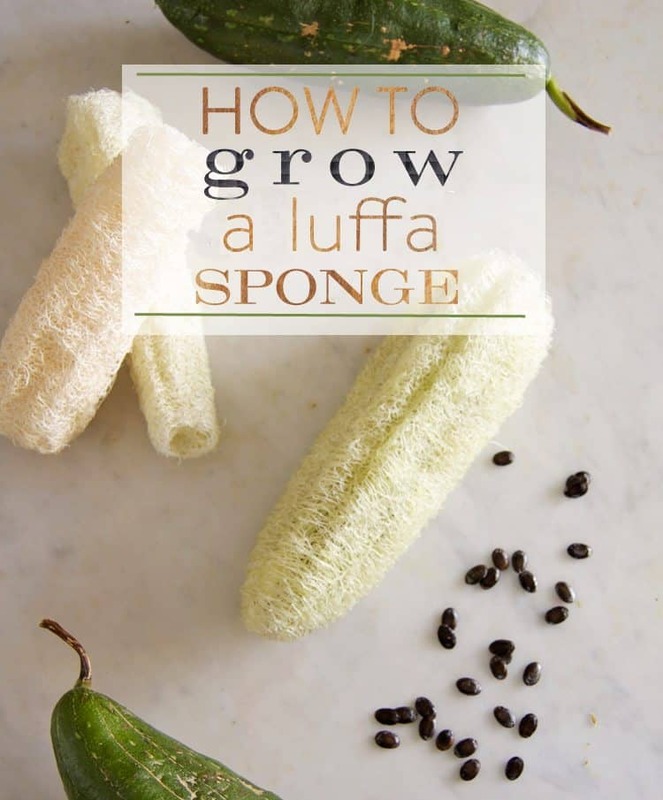 This year I didn’t want to go through that uncertainty, plus I wanted to write this post on how to successfully grow Luffa sponges and that wasn’t going to happen if I couldn’t even germinate a few seeds myself. So I went out and bought this seed heating pad. Luffa seeds like a lot of consistent heat to germinate and grow. I figured the $20 it cost for the seed heating pad would be worth it if it would guarantee germination. I started 2 pots of Luffa seeds. I set one pot on the heating pad and one on an unheated tray. The seeds on the heating pad germinated within 3 days at a rate of 100% (all 6 seeds sprouted). The seeds that were unheated germinated in 10 days at a rate of 50% (3 seeds sprouted). I kept the seeded pots in their respective places as they grew and the heated seedlings grew at twice the speed as the unheated ones. If you’re serious about growing your own Luffa buy the heated seed pad. It also happens to be the perfect size for sitting an entire seed tray on so you can use it to increase the germination rate of other seeds that like bottom warmth to germinate like tomatoes, asparagus, peas and peppers. It’s also working GREAT for my Sweet Potato slips, but that information is for another post. I’m getting significantly better growth than I did with my old Sweet Potato slip growing method. 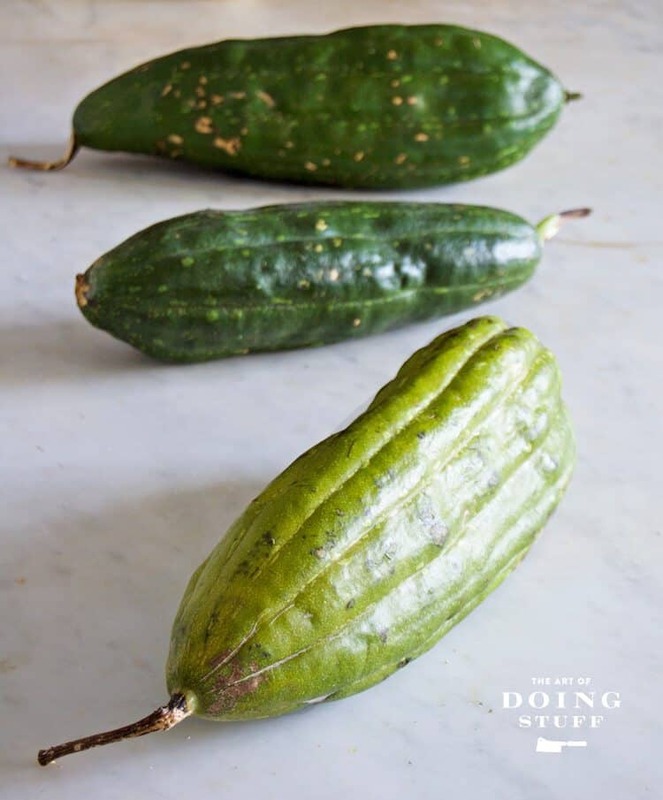 Once your Luffa seedlings have their first “true” set of leaves (the leaves that look like the leaves of the actual plant, not the first set of leaves which are just practice leaves basically) you can transplant them into their own pots. 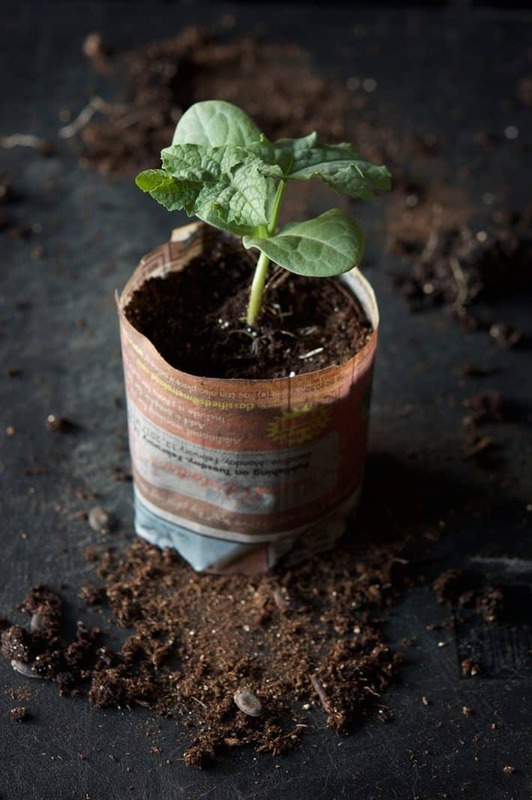 Gently separate the seedlings and plant them in either store bought biodegradable pots or make your own newspaper pots like I show you here. Biodegradable pots can be planted right in the ground making the very, VERY finicky Luffa plant less likely to go into transplant shock. Don’t have a big vegetable garden? No problem. You can plant Luffa plants in a big pot on a balcony or backyard as long as you provide the vines with something to grow on. Don’t forget they can easily get to be 30′ long under the right conditions. Part of the reason I had such good success with my germination rate is that I harvested the seeds myself, from my own Luffa, only a few months ago. That’s half the battle, having fresh seeds. But if you don’t have that luxury you can buy a packet of luffa seeds on Amazon for $2.99 from the very reputable Renee’s Garden seed company. So there. Now I’ve told you how to do it. My job is done. How to Grow Your Own Luffah Sponge. Find out why there’s NO menu this week. Mind BLOWN! I had no idea these were a grown-in-the-dirt thing! Which leads me to my next question…what were they actually used for? Are they edible? Can you make soup with them? Or are they purely for making me super soft? Craziness! All of the above, Julie. Wow! I’ve never thought of growing them myself. You are amazing Karen – lots of new facts and ideas. We get lots and lots and lots of sun (and no frost…or rain lately sadly) so it would be perfect growing them here. I suppose they could also be used as “little wigs” in relation to your previous posts. Go on FaceBook to Deb Terrel’s “Luv a Luffa” page in Aurora, Tx. She was sending seeds out for free. I said yes to her offer and she mailed me 40-50 seeds. YES, where does one procure Luffa seeds? I purchased mine from a Burpee catalog many years ago, when I experimented planting one unusual crop each year. But…alas, they’ve cut back and I haven’t seen them lately. Gotta be a catalog with luffa seeds available out there somewhere. Baker Creek catalogue has all the rare and heirloom seeds you can possibly think of. I buy all of my odd ball seeds through them and they’re very reasonably priced as well. Go to Karen’s link above, 2nd paragraph under the 2nd photo. It says “Luffa sponge” and it will take you to Amazon, where they have the seeds for sale. I don’t know if this will assist anyone else who was experiencing the site ‘freezing’ as it was doing a few nights ago but I was able to eliminate this by closing the site on my email posting notification that there was a new entry and going to the main internet and typing in “The Art of Doing Stuff.” I was directed to the site and I then had no trouble navigating. Ha! I’ve spent the past 2 days not writing posts, but going over my entire site and all of its guts to improve the load time. 🙂 So that is probably what’s helping. I hope to get it even faster in the next week or so. ~ karen! I was just wondering how to get hold of some of those seeds!! Now to get them to SA!! I really really would like to give that a bash to grow! I would be interested in loofah seeds if you have any left. Would you have a few to send to me in California? Please & Thank you?! i have lots of seeds, but not sure if I am allowed to send them overseas. Hi Gertie… I would be interested in trading you Moringa seeds for Loofa. Shall we? Hi Gertie…. BTW, I had an Aunt Gertie…. Id be happy to trade Moringa seeds for loofa. Send me your address and I will forward. Hi! So happy to read your post. If you still have seeds to share, I would very much appreciate some. Thanks! not sure if I am allowed to send them overseas. Gertie, there is no prohibition to sending seeds by mail as long as the plant isn’t illegal to own. the only thing that cannot be shipped into Texas is Citrus plants from other states. Would love to have some seeds if any are available. My address is above. Thank you! I will send some to you as soon as I go into town. I would love loofah seeds please!!! 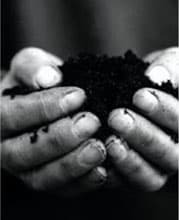 I can see how generous you have already been but I thought there is no harm in reaching out to you to see if you were still offering a few seeds? Yes! I live in Sacramento and I’ve grown luffa many, many times — our long, hot summers are excellent for this crop. I got my first seeds from a friend who had been growing them for years. 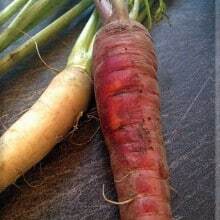 This is the first time ever that I haven’t had to be jealous of the beautiful things Karen grows in her gardens, and I can’t even be smug because I have nothing to do with the climate. When do you start to seed your luffa if you live in Oakland CA? 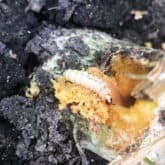 and when should you move them outdoor? I have never grown anything in my entire life. I would like luffa to be my 1st plant. I’m in Sacramento, so you in the East Bay have pretty different growing conditions than we do — near the ocean, none of that Central Valley summer that we do — so I’m not sure I’ll be that much help. But I’m pretty sure you should plant them directly in the ground just like we do. I plant mine sometime in late March, but you should ask someone near where you live when they plant cucumbers — it will be the same. If you have a local nursery (a real one, not just the plant section of some other store) ask them for advice. Plant in full sun, and if you don’t have a veggie garden already, plant them near a fence or something that they can climb. Good luck! Luffa’s are loads of fun. I am from ca. They do grow here. Did you ever get any seeds? I just found this site. Loufa seeds are available on amazon! Since I never win anything, I figured I’d look! So much fun. What do you figure the days to harvest on these? We’ve got a very long growing season where I live (approx. Mar-Nov), and typically direct seed squashes and gourds and melons and other fussy-transplanters. I wonder if I could get away with it with gourds? I plant out seedlings June 1st Kristina (because they’re so shell shocked by cool temps) and harvested this year in the middle of October just before the first frost. ~ karen! I grew some back in the 80s. Fun, til you have to peel them. I’ll have to try them again. I know I’ll have a better success rate with all the tips you’ve given us. I’m in zone 6a in Michigan, and my luffas were tiny compared to yours. Great job! Sacrilege! Shut up, Patti! WTH are you trying to Do? LOL JK I can’t imagine Karen not taking on a challenge and not sharing her infinite wisdom. Love it. Saving a lot of moola by doing things rather than just going shopping. I CAN get “satisfaction” all by myself. Dear Patti…Obviously you are on the longer side of life…me…being on the shorter side will now offer you some advice (cause us old people are full of it..advice)…The rest of your life will be much more interesting if you listen and learn a few things along the way..even if it’s something you don’t care to do…there are people out here who actually think planting and growing stuff is fun!..just imagine it… so give it a try…who knows..you might end up having some fun…besides…at the end of this short trip we are all on they’ll need something to put in your obituary…LOL.. I love the idea of doing things in order to have an interesting obituary. should get working on that! Laughing. Out. Loud. I’m with you, Patti. I completely believe in the superiority of homegrown tomatoes, avoiding the ridiculous cost of paying painters, and trying something like building a pizza oven for the sheer fun of it, but if loofah are that finicky, I’ll just buy ’em and put the effort into something else. But I’m glad Karen wrote about ’em regardless, because learning what I don’t want to do is just as valuable as learning a great way to do something I do want to do. And I’m gobsmacked that loofah come from the garden, not the ocean–I woulda bet money on that! Yeah, my grandmother would only use a loofah to scrub dishes. They don’t last long for that. And she nearly cried (with joy) when my uncle brought her about 10 of them ………. from the store. Potatoes and yogurt, now that’s different. And in a million years I would not pay somebody to paint anything. Whoa! Maybe there could be a generational luffa seed exchange and agricultural conglomerate experiment, planting seeds of luffa (and hope) all ove! It will be fun to hear how others fare with your luffa seeds. Holy canolli! Like everyone else, I figured it was a sea thing, not the innards of a gourd. The ones with the seeds look like some sort of alien pod. Also, how weird that the “starter leaves” are such different shapes from the regular ones! I’ve got a black thumb, so I’m not sure: is that a normal plant thing or is this kind of unique? That’s a very normal thing Nicole. All plants first two leaves that emerge are cotyledons. The rest of the leaves are the “true” leaves. ~ karen! Cotyledons sounds like a kind of dinosaur. Rawr! Or a fancy kind of coming-out dance in the South. or, perhaps, a slightly unsavory skin rash…. I saw the link to growing quinoa. 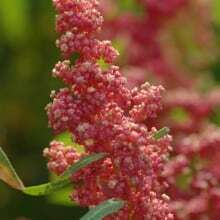 Was there a follow up on your quinoa growing venture? Thanks for the post. I would love some seeds to grow. I am in Ontario. This may be something everyone knows already, but I have found that using pure water, like home-filtered or bottled, instead of fluoridated/chlorinated/etc. city water can make a big difference in the rate of seeds that germinate. Later, they’re not so picky, but germinating is apparently quite a challenge, sometimes. 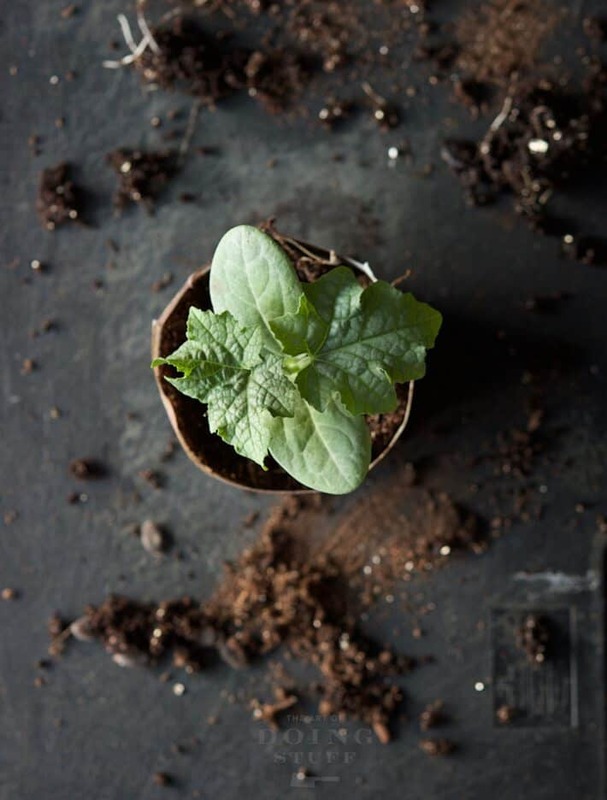 You can also use city water if you let the chlorine evaporate for a day or so…for my houseplants and my seeds, I fill up my copper watering can and let it sit for a day or so – this allows the chlorine to dissipate and the water to get to same temperature as the plants. Cheap but effective! I love reading about climates where you have to get heat pads and worry about frost. I live in a subtropical region, and it can be really hard when you’re first starting out with gardening here as almost all our commercial advice is geared towards the southern (Australian) states – temperate climates and places where summer is the main growing season. Here in the subtropics, summer is basically the dead zone for the usual kitchen garden stuff. Autumn, winter and spring are the ideal growing times. Anyway, I hope that one day in the future I’ll be able to experience your sort of growing conditions. Mostly potatoes really – they just do not do well in the subtropics. This is so cool. I had no idea they were grown this way. I too have been very, very unsuccessful at growing Luffa for the better part of a decade. I’m wondering if I couldn’t just grow them indoors, period and screw putting them outside. My seed supply is low so perhaps I will procure some of yours when available and try, try again. I’ve considered trying loofah before but usually end up starting dozens of flowers instead BUUUt if your giving away seed…and I happen to have a heating mat just for my seeds. I’ve always started me plants this way unless it is specified not to. Makes sense: most things like warm soil to germinate. And you don’t need the $30 “plant mat” either. Any heating will work-just use the lowest setting. Growing plants is something I look forward to every year-always amazes me how these little seeds can grow into something fantastic that you can smell and appreciate or pick and eat. Karen, do you want some pibk banana squash seed? I’ll trade you! Best squash ever. Oh my gosh, forgive the typos! I’m using an iphone 5 and use my fingernails to type. Pibk banana squash seed?? LOL. I don’t know what that is! Time to Google! One word of caution about using “anything” for heating your seeds, lol. The little heating pads are waterproof and they’re meant to run for a long time so in terms of safety they have a bit of an advantage. 🙂 ~ karen! I knew my typo would catch your eye! Pink banana squash. Great keeper. Grows into massive oblong fruits with a pinky hue. Great for pies, soup or anything, really. Purees like a dream and SO fun to grow. Strangely not very popular but now I don’t go without! I would love to try growing luffas. I do my gardening at camp. (Yes I’m in Northern Ontario hence the name camp) I do have indoor plumbing and all of the amenities of the house. I just love gardening at camp. The plants thrive with the lake water. I started with a few raised garden about 6 years ago and the number of raised boxes keep growing. My biggest challenge are the chipmunks and squirrels. They love all of the fresh produce that I grow. Hopefully they would not like the luffas. I’m certain I would just kill them. Thank you for this post. I tried once before to grow them with no luck. I will try your method this year. I love your sense of humor, a lot like mine YIKES! GOT LUFFA? Would love to win some, I’m in Alabama and our growing season is long, to the point of you get so darn tired of growing and pulling weeds. Thanks for you information, always entertaining. So glad you posted this! I tried growing Liffa and longneck gourds last year. The luffa vines but all I got was one puny 6″ long gourd. I gave up on my longnecks and in August they started going gangbusters. I ended up with about twenty of those, and now have no idea what to do with them. Both vines grew up a trellis, over a pergola and then on up into the trees. (Which made for interesting harvesting). So yes, they can absolutely grow to 30 feet. Going to try for Luffa again this year. Hoping to incorporate them into Christmas gifts. I have never used a loofah-what is the attraction? It’s a lovely combination of soft and scratchy when it’s wet and will actually last a long time, despite its fragile appearance. Then when it finally wears out, you compost it. I first encountered loofahs when I lived in Brazil in the 60’s. Ours were about two feet long. I used what I suspect was a less than fresh packet of seeds one year and with no particular specialized knowledge, just determination and dumb luck, I managed to grow luffa fruit on the vines but the early frost got them ( and my birdhouse and snake gourds 🙁 ) I am just at a tiny bit higher elevation than you on the Escarpment, which means earlier frost. If I’d only had that ONE NUGGET of info about being able to pick them early, Gah! I am armed and ready! I tried growing them for the first time this past year – in my first garden as an adult. It was a very warm fall, which was unusual, so they had more time to grow. I finally picked them, but only ended up with one out of about 6 that I could actually peel and use, the rest just started to grow fur coats for the winter, even while leaving them on the back porch to continue to dry. I waited waaaayyyyy too long to plant them, not knowing a damn thing about how they grow. This year, I’m going to start them inside, hopefully in about a month – and I might get that heat pad thing-a-ma-jig! How much space is needed for the vines (vertically / horizontally)? I am SO doing this! Seems much more manageable than my corn and pepper growing efforts. I’ll put them in big pot on the kitchen porch where they can decorate my railing and it will be easy to water them. I grew these a couple of summers ago and will again this year. I didn’t have any problems but then I’m in South Carolina….so that makes a big difference. Don’t you just love the bright yellow blooms? I would grow them just to see those….but then the luffas do make great “homemade” presents. Hi Lori! I was going to get into the big yellow flowers but the post was so huge as it was I left them out. but you’re right. When they’re covered in flowers the vines are spectacular. 🙂 ~ karen! Thanks for the tips. I have tried 2 years to grow luffa, once in a big pot and the other in my community garden plot. Lots of success with leaves but no gourds. Lots of success with people asking what the vine was though. Maybe this year I will give it one more try, babying it more, singing to it, encouraging it to push out a gourd. Fun! Love learning from your mistakes. And I think I need seed heating pad. And an enormous greenhouse. But not a Brazilian. Unless said Brazilian is working as cute gardening guy. I had no idea they were such creeps. This explains the big loofa plants I grew that never bloomed! I will succeed this year, and all because of you! Who knew? Not me! Love learning something new every day and I would love to grow my own loofah! I have the seed germinating/heating pad, biodegradable pots, seed starting setup in my basement and the room in my garden bed with strong support! So it would be really cool to get some seeds from you this season! Hi Karen, this sounds like fun and big yellow flowers? Even better. I am in zone 5, I think, Ottawa? Can I start seeds inside earlier? How big can I let the seedlings get before putting them in biodegradable pots? I’ve never once thought about growing these…(partially because I thought they grew in the ocean…lol) but after reading this you have really peaked my interest. I think I will try it! I WOULD LOVE SOME OF THOSE MAGICAL SEEDS!!! How do I enter the contest??? That heating pad looks suspiciously like the naked element of the medical heating pad I am shivering along on today. Makes me wonder if I threw it in a corner and added some old sweet potatoes, what the result would be? I would love to end up with a 5-10 gallon bucket of sweet potatoes next October.